I’ve written before urging users of PC/104 and other small form factor stackable technologies to get involved in the standards organizations that define the future of these technologies. Since then, I sure haven’t seen a mad rush of users to join in these discussions. Users of these technologies seem to be content to leave it up to manufacturers and suppliers of stackable architecture boards to define new generations of these technologies. By doing so, users leave themselves at the mercy of a particular supplier’s world view with respect to feature content and, more importantly, legacy compatibility – a worldview that might be influenced by products already developed and brought to market without deep discussion and before the standard is even published. So if big users of stackable SFF technologies are not interested in joining standards bodies and participating in the technical discussions that define future generations of these technologies, they can still do the next best thing – albeit after the fact. As the number of third-generation stackable architectures proliferates, users need to “vote with their feet” by first understanding the alternatives available, and then specifying and standing behind the solution that they determine best meets the particular needs of their applications – and the overall market. When technology reaches a point of discontinuity where the proliferation of old bus technologies and support for legacy products are at risk, users need to move beyond brand loyalty and price to fully understand the technical alternatives and legacy support available with these alternatives. Users need to decide whether the low-cost bus of the future is USB 3.0 or SPI and vote – even if they aren’t using either of these in their applications. Users need to decide how important it is to retain the use of legacy PC/104 (ISA) I/O cards in stackable applications and vote. PCI Express lanes can be provided to stackable applications in many ways, but there are big differences among the solutions. Users need to understand these differences and vote! Recently, the Request for Proposal behind one of the largest procurements of stackable architecture solutions in history, issued by a prime defense contractor to the U.S. Military (not identified to ensure confidentiality), specified that the only acceptable solution must use SFF-SIG’s SUMIT board-to-board interface together with the PC/104 (ISA) bus. This user did the research, considered the available alternatives, and felt strongly enough to mandate SUMIT in all supplier proposals for his application. SFF-SIG believes that if other users do their homework as well, SUMIT will emerge as the dominant force among third-generation stackable alternatives. 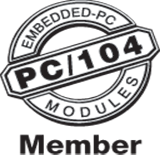 PC/104 and other small form factor stackable solutions such as SUMIT-ISM are the heart of hundreds, if not thousands, of critical embedded applications. Apathy and the resulting lack of active participation in standards organizations threaten these technologies and the successful implementation of future generations of these applications. This apathy comes in two flavors: One, some suppliers are content to let a few vocal companies dominate the discussion and define the future for them; and two, users, rather than actively participating, make product selections based upon brand loyalty or price without understanding the underlying technology issues. Not getting involved falsely assumes that these standards will automatically evolve in an appropriate direction for each application. Suppose legacy software and existing I/O cards need to be ported to a new bus in order to utilize new processors on the market. This could lead to a substantial hardware and software redesign, adding perhaps significant cost to future application development. Who should decide whether “legacy-free” is good or bad? The users of this technology, that’s who! Fight apathy! Do the homework! Understand the technical alternatives! We’re confident that when users take these steps they’ll write SUMIT into their next Requests for Proposal too. The polls are open. It’s time to vote!